Since the discovery of electricity, people have been looking for effective energy storage methods for its further usage if needed. Over the last century, the energy storage sector has continued to evolve and adapt to the changing needs of energy supply. Enterprises and private consumers are also extremely interested in the possibility of storage electricity to eliminate overloads and to smooth the fluctuations of power occurring irrespective of the production of renewable energy. Nowadays, there is a rapid increase in generating capacities around the world, which has led to the development of energy accumulation technologies for large-scale electricity production. There are many ways to store energy, but it’s important to determine which technologies are suited the best way to meet current and future needs. Let’s take a determined look at industrial and domestic energy storage systems. The world energy system makes confident steps towards decarbonising: it adds more renewable energy sources (RES), reduces storage costs. Studies have shown that a faster than expected reduction in the cost of energy savings and the use of variable energy sources may increase the need for ESS to over 400 GWh by 2030. Energy storage systems provide a wide range of technological approaches to managing our energy supply. Let’s consider only the main categories. 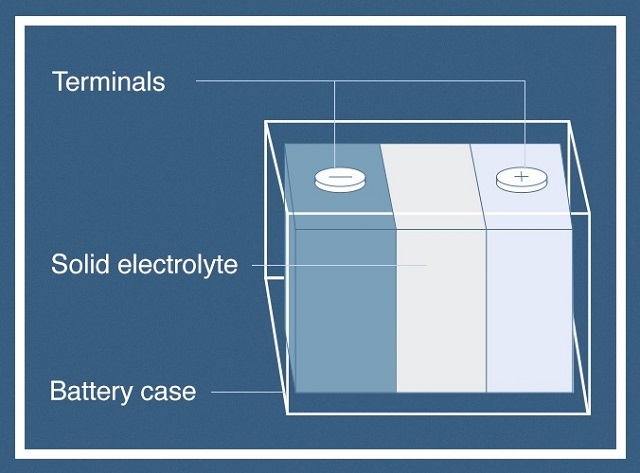 Solid-state batteries – a number of electrochemical drives, including modern chemical accumulators and capacitors (Fig. 1). Fig. 1. Solid State Batteries. Source: Online edition of Energy storage networks, An overview of 6 energy storage methods, Feb'18. 2. 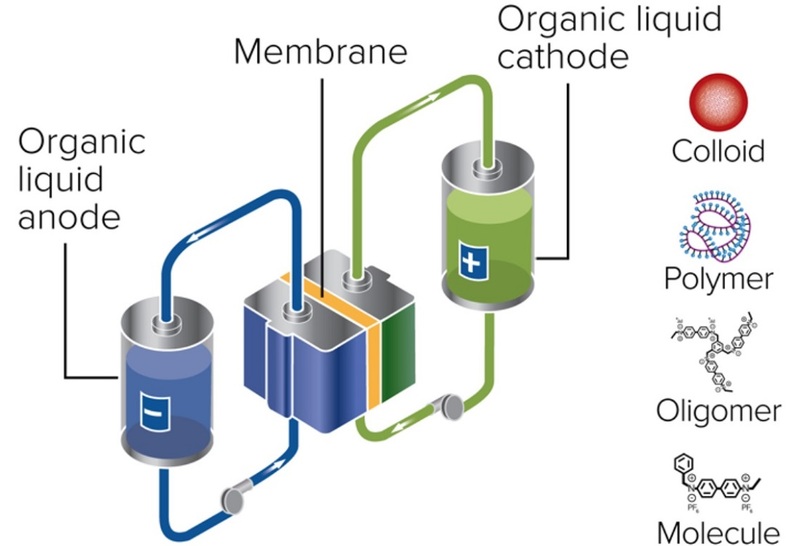 Flow batteries – accumulators in which the energy is accumulated directly in the solution of the electrolyte to increase the lifetime and instantaneous action (Fig. 2). Fig. 2. Principle of a battery operation. Source: Online Power Electronics, 6 Promising Energy Storage Options to Tie into the Grid, Feb'18. 3. Flywheels – mechanical devices using the rotational energy for instantaneous electric current supply (Fig. 3). Temporal Power company announces the creation of superhighlights with a output power of 500 kW per each. Fig. 3. The principle operation example of the flywheel company ABB. Source: Online Power Electronics, 6 Promising Energy Storage Options to Tie into the Grid, Feb'18. 4. Energy storage system based on compressed air (Fig. 4). With this method you can create a powerful energy reserve. The Canadian company Hydrostor, in partnership with AECOM, is leading the introduction of this technology, both at sea and on land. Fig. 4. Energy storage due to the compressed air. Source: the website of the Pacific Northwest National Laboratory, Compressed Air Energy Storage, Apr'17. 5. Storage of thermal energy – the accumulation of heat and cold to generate energy on demand and its allocation in a convenient time for consumers. 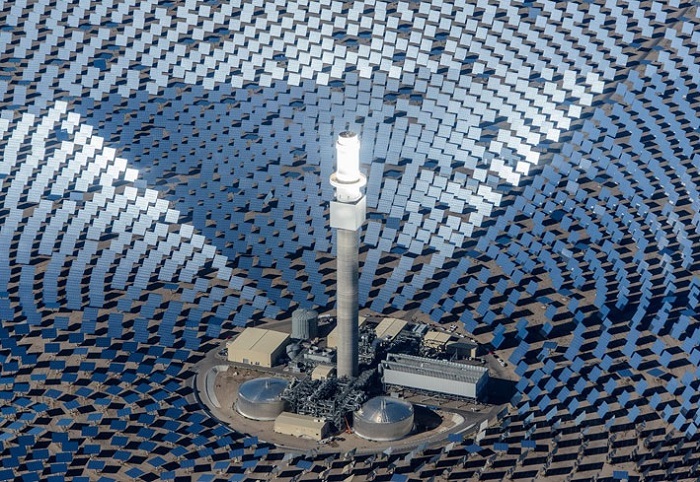 The main benchmark for such solar power plants is the Crescent Dunes Solar Reserve in Nevada, USA, with a capacity of 110 MW (photo 1). Photo 1. Power Station Crescent Dunes Solar Reserve, Nevada, USA. Source: Online Power Electronics, 6 Promising Energy Storage Options to Tie into the Grid, Feb'18. 6. 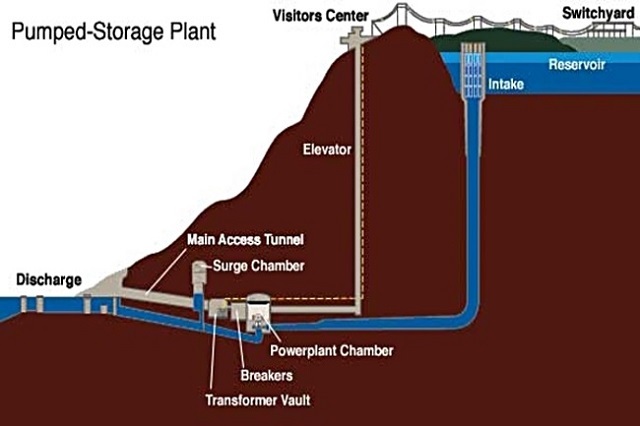 Pump hydropower plant – creation and storage of energy using two water tanks located at different heights (Fig. 5). A well-known example of this technology is La Muela from Iberdrola, the largest hydrocomplex in Spain and Europe. Fig. 5. Principle of operation of the pump hydroelectric power station. 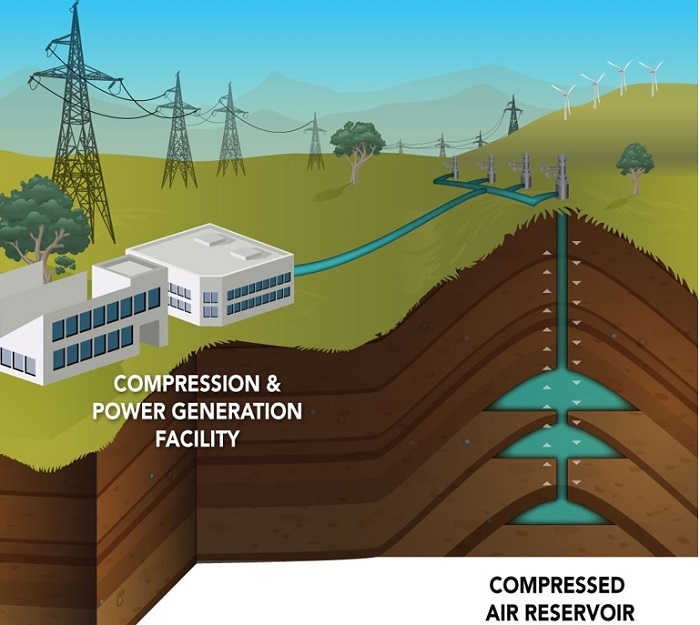 Source: Wikipedia, Pumped-storage hydroelectricity. 7. Gravity energy storage devices are devices that generate electricity, releasing heavy loads from a certain height if necessary. Ares is a leading company in this field, which claims that this technology is 40% cheaper than a hydroelectric power plant, and is more efficient (Figure 6). Fig. 6. Comparison of energy accumulation technologies. Source: Magnus Online Magazine, Energy Storage: Present or Future, Apr'17. By the way, lithium-ion batteries are the most popular elements that are used in modern energy storage devices both at home and on an industrial scale. Today, most ESS are located in Europe, North America, East and Central Asia, as well as the Pacific Ocean. The leading countries in this area are the USA, South Korea, Japan and a number of European countries, including Germany, Great Britain and Italy. Overall, about 96% of projects are installed in these countries. The rest of 4% are in China and South America, mainly in Chile. The Middle East and North Africa, South Asia and sub-Saharan Africa have only a small amount of energy storage systems. There are a lot of ESS players on the market, we will enumerate only top companies. Frost & Sullivan, an energy market research company, has published a report that assumes that the ESS market by 2025 will increase proceeds from $ 160.4 million (2017 data) to 1.6 billion. It is expected that by this time the USA, Australia, Germany and the United Kingdom will bring annual revenue of $ 1.5 billion. 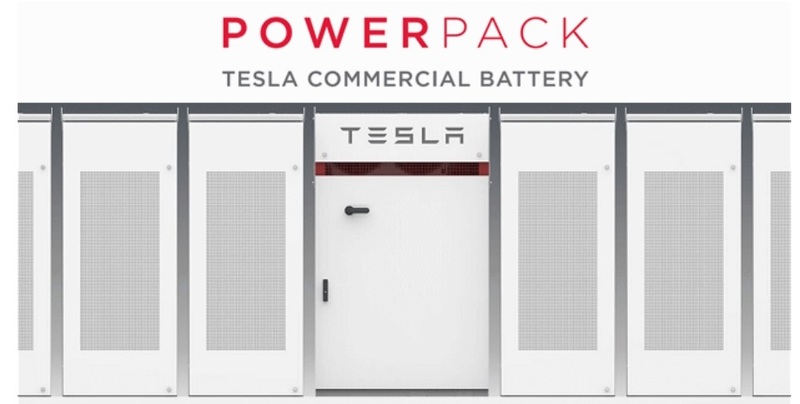 Tesla Powerpack – the leading product for storing energy on an industrial scale (photo 2). This is the largest lithium ion battery with a capacity of 129 MWh and a capacity of 100 MW. ESS is installed on the Hornsdale wind farm in South Australia. Photo 2. ESS Industrial ESP Tesla Powerpack. Source: Online edition Energy matters, WA buys Tesla Powerpack battery to store community solar energy, Oct'18. The Solar Energy Engineer also deals with energy storage under the Helix trademark. It designs, installs and operates battery systems with its own software for monitoring and optimizing solar energy generation. The company’s budget provides significant amounts in US dollars for commercial storage of energy storage systems. The StorEDGE product provides backup power and limits the export of solar energy, thereby saving customers money. The company supplies inverters and other components for both domestic and industrial installers. Tesla Powerwall – the most famous battery for solar power stations of domestic use. Powerwall combines an inverter with a battery of 13.5 kWh and can be connected to solar cells, as well as Tesla cars, to charge and provide back-up power to the home. In early 2018, Tesla unveiled information on the launch of the world’s largest network of lithium-ion batteries in South Australia and its plan to install Powerwall 2 solar panels in 50,000 homes in the same place (photo 3). Photo 3. 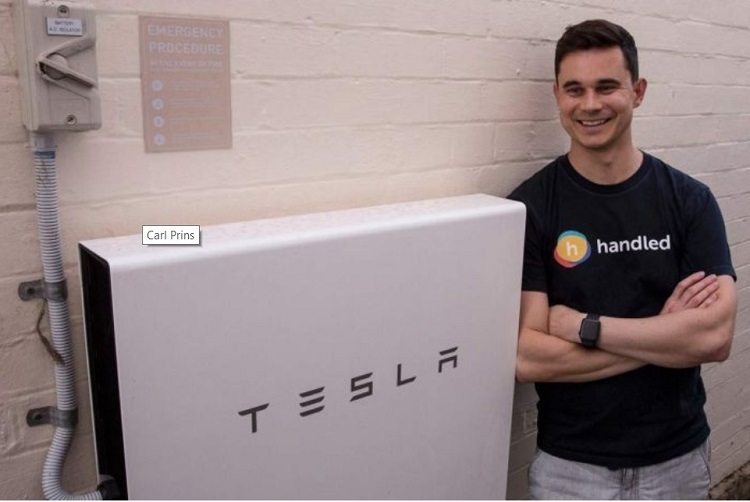 Carl Prince waited five months until Tesla Powerwall 2 would be installed. Source: Website https://www.abc.net.au, Meet the man who was off the grid as Sydney's eastern suburbs went dark, Feb '19. Vivint Solar , in collaboration with Mercedes-Benz, is developing 2.5kWh energy accumulation systems that can be combined with a power unit up to 20kWh. 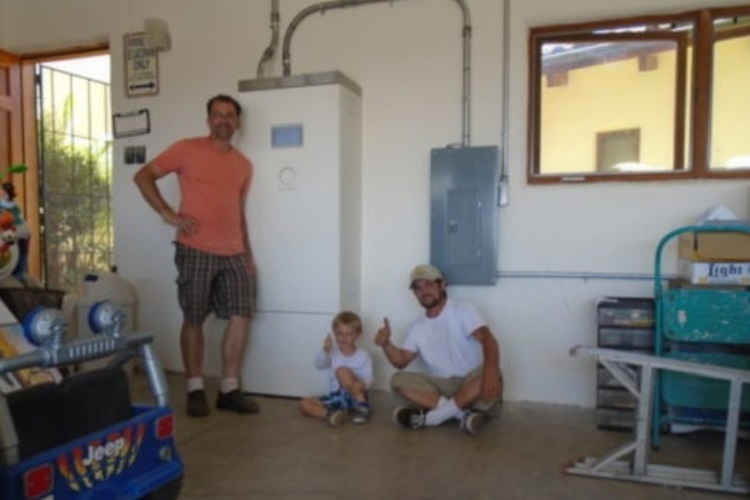 This home-based battery system competes with Tesla – in terms of cost and efficiency. Consumers can use batteries to store excessive solar energy produced during the day, and then use it during periods of peak power consumption (evening and night) when electricity tariffs are usually higher. LG Electronics, one of the world’s leading battery manufacturing companies, offers a series of energy storage systems LG (ESS), which consists of two high-voltage (RESU7H and RESU10H) and three low-voltage battery systems (RESU3.3, RESU6.5 and RESU10). High-voltage models also provide a variety of inverters that allow consumers to convert DC power gained from solar panels into a usable variable. 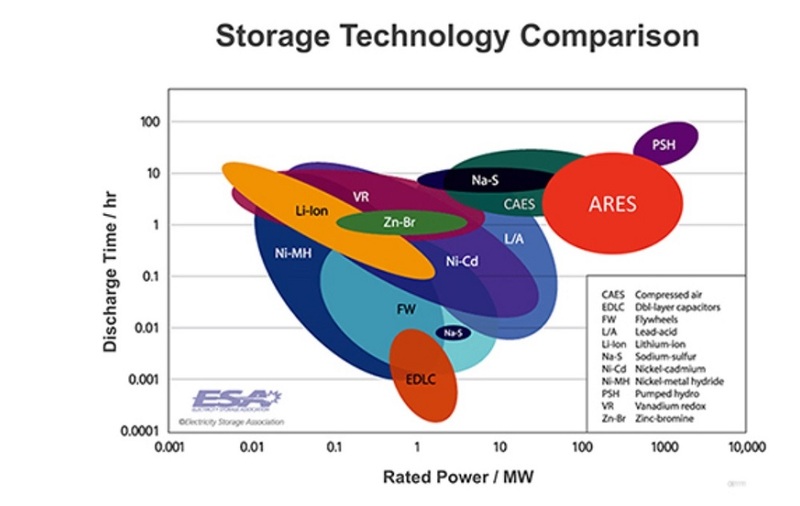 Eos Energy Storage offers its customers an attractive energy storage solution. The Eos Aurora flagship product is a low-cost DC battery pack specially designed to meet the energy storage needs of the network. The system is designed for four hours of continuous discharging, it can be scaled up and adjusted to reduce utility costs. SonnenBatterie eco uses Lithium-Iron-Phosphate Battery (LiFePO4) technology developed in Germany. In addition to battery modules, the energy storage system consists of an inverter, power manager, power measurement technology and software. According to the company, the product is equipped with a system for detecting power, which in real time will find faults and automatically switch to battery power. Sonnen recently started a power plant in Atlanta to begin manufacturing for the US market (photo 4). Photo 4. Installation the Sonnen battery for your household needs. Source: Online edition Energy storage networks, Sonnen and HelioPower install first SonnenBatterie eco 10 system on California home, Feb'17. The company offers a solution for rechargeable batteries called xStorage, which holds 4.2 kWh of energy. According to company representatives, the ability of xStorage to control when to take power from the network and reduce peak consumption helps consumers reduce their electricity costs. The Sunverge One and Infinity batteries provide energy from 7.7 kW to 19.4 kWh. There is also a certain application for the smartphone, so consumers can track how many percent of solar energy is stored at any time. The company manufactures zinc bromine batteries Redflow ZBM2 and ZCell. Thanks to the plug-and-play storage system and the ability to control independently, protect, and monitor in 24/7 mode, battery data can transfer energy in large volumes. 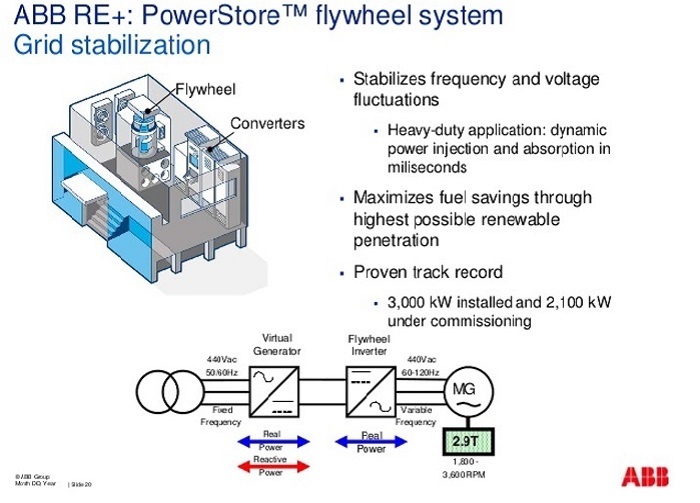 The company already has its Siestorage trademark for container energy storage. But in February 2019, Siemens introduced Junelight Smart Battery, an energy storage system based on lithium-ion batteries for private households (photo 5). Real-time monitoring is available through the mobile application, and the system can also be configured for power up to 19.8 kWh, if you combine six modular units of 3.3 kWh. Photo 5. Siemens ESS for household use. 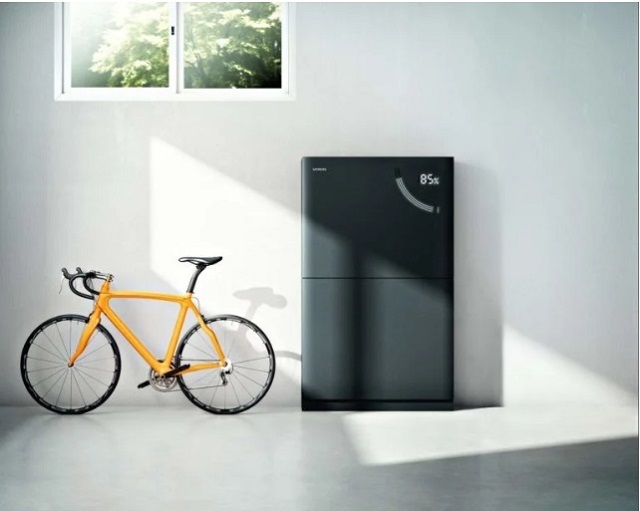 Source: Clean technica online edition, Siemens Enters Residential Storage Market with Junelight Smart Battery, Feb. 19. In 2015, the company has completed the work on the “smart city” of Fujisawa in Japan. All the city’s buildings were connected to the intellectual power system on solar energy, which allows the district to work autonomously for up to three days. Over the next decade, the company will strive to repeat the success of Fujisawa’s network of micro-networks in Denver (USA) and start new projects throughout the country. Recently, Toyota Motor and Panasonic Corporation have announced the creation of a joint venture for prismatic lithium ion batteries, solid-state batteries and new-generation batteries for electric vehicles. In addition to the statements mentioned above, in Australia, not long ago, the green bonds began to be issued that give people the opportunity to invest in energy storage. The National Energy Financing Corporations (CEFCs) of the country have invested 10 million Australian dollars in issuing USD 90 million bonds. The goal is to stimulate institutional investors to help accelerate the deployment of solar photovoltaic systems on roofs of buildings and small energy storage systems. Energy storage systems will help to move from fossil fuels to global decarbonization and the future of fully renewable energy. The cost of electricity production can fluctuate, being cheaper at one point and more expensive – in another. ESS can help to balance costs. To smooth the stream of renewable energy, the growth of which may be unstable and unpredictable. As soon as the ESS is integrated into the power supply systems, they can be backed up in the event of a failure of the main source of energy. Indemnity during natural disasters, such as hurricanes, and not only. Will play an important role in managing deliveries from periodically renewable sources and will help to eliminate emissions from imported electricity. Thanks to the ESS, mankind will be able to switch from power supply sources of variable action to a continuous, reliable flow of energy from REE. It is important for achieving the full technical potential of solar and wind power plants as well as electric vehicles.